Feasibility Study and Finance Team – Decide if your project can be done through the Maricopa Contact IDA (Contact Us for help) and assemble finance team. Complete Application and Pay Fee – Currently, a $3,000 non-refundable fee is due with application. Publish TEFRA Notice and have Hearing– Notice of public hearing must be published at least 2 weeks prior to hearing date; must identify project and owner; and must specify maximum dollar amount. Obtain Bond Volume Cap – Annual Funding limit set by Federal Government for tax-free bonds (except for 501(c)(3) organizations). Draft Bond Documents – Generally done concurrently with above steps. Typically takes two to six weeks but can take longer. Government Approvals – Receive Maricopa County IDA Board approval, Maricopa County Board of Supervisor approval and Arizona State Attorney General signoff. 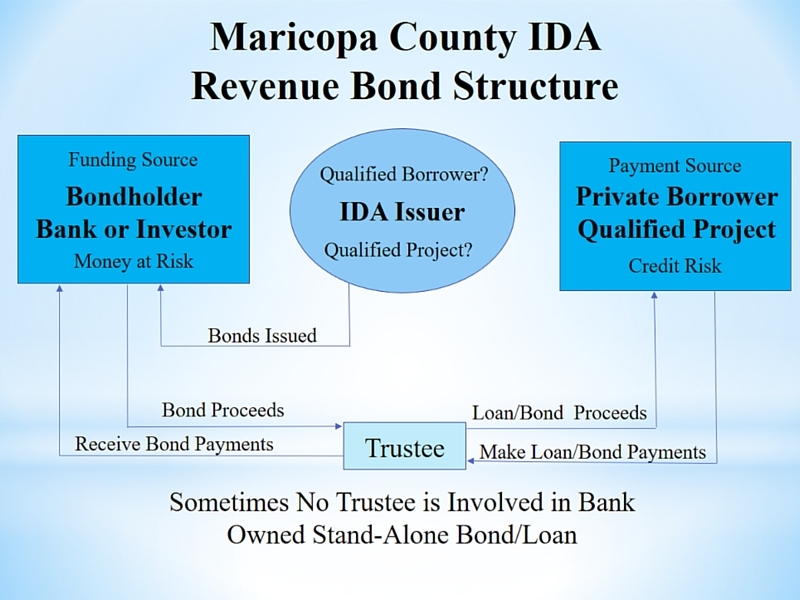 Issuer – Political subdivision (Maricopa County IDA) issues bonds to Bondholders (Lenders) who use their own money to lend to the borrower. The Maricopa County IDA has no direct financial responsibility. Borrower – the ultimate user of bond proceeds and obligor. Borrower makes principal and interest payments to bond trustee. Underwriter or Placement Agency structures the transaction and prices and sells the bonds to the investors or places the bonds. Banks may privately place bonds (hold for their own account). Trustee – Third party commercial bank or trust company to whom Issuer assigns its rights and to whom credit enhancement runs; uses funds from Borrower to pay principal and interest due on bonds to bondholders; and acts on behalf of bondholders to safeguard trust estate. Bond Counsel – Prepares bond documents and provides opinion that bonds are validly issued, enforceable, and interest income is tax-exempt to the bondholder.